New personal testimony reveals Tony Voros’ experience with Dr. and Master Zhi Gang Sha’s new interactive Soul Healing Miracles ™ Chanting Television Channel where he learned alternative healing techniques to relieve stroke symptoms. In the testimony, Tony writes how "after suffering from a left side stroke, was partially blind in the left eye, experienced paralysis in both hands and left leg, had trouble following conversations and was unable to walk without dragging my left foot." Then, Tony writes, " after hearing about Dr. and Master Sha’s Chanting Television Channel from my wife, we logged onto the Channel in the hospital for 24 hours to listen to chanting practices and recite easy to understand mantras." Read Tony Voros' testimony on http://tv.drsha.com. “I started experiencing an immediate lift in my mood during the very first day,” says Tony Voros, 55 years old. “Because my stroke was atypical, my doctors told me that I would need months of recovery time with physical and speech therapists, but in the time that it took for my wife to fill out the paperwork for those therapies, I was already experiencing changes in my condition. Within 24 hours every part of my body started working better. But the most dramatic thing that happened was within the first 12 hours of listening to the healing mantras -- most of my stroke symptoms went away. I felt like my old self again and no one could believe I suffered a stroke. Master Sha’s blessings and the Chanting Channel community saved my life,” Tony Voros adds. For the first time ever, Dr. and Master Sha bridges the world with a 24 hour a day, 7 days a week interactive Soul Healing Miracles™ Chanting Television Channel to teach others how to self-heal and join hearts and souls together to heal the world with soul-guided chanting through the teachings of sound therapy led by his Divine Channels and advanced students. To see Tony Voros' personal testimony and to experience a personal transformation, go to the Chanting Channel: http://tv.drsha.com. Watch the promotional video: https://www.youtube.com/watch?v=sz5JfcblbmI#t=12. With over 100,000 Facebook fans and more than 250,000 followers worldwide, Dr. and Master Sha’s New York Times bestselling books helped to create a demand for people to see him in-person all over the world, and has inspired national television shows, e-books, videos, and cds. 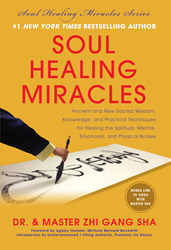 Now, Dr. and Master Sha presents the Soul Healing Miracles™ Chanting Channel available anytime, anywhere via webcast television. Completely interactive and free, Dr. and Master Sha’s Chanting Channel provides viewers with opportunities for developing their spiritual journeys by learning to use chanting for healing, as well as ask questions, request blessings, and interact with Master Sha and his Worldwide Representatives anywhere in the world.